FREE Smoker/Roaster with select TEC Grills. For a limited time only, get a FREE infrared smoker/roaster rack with the purchase of any TEC G-Sport, Patio, or Sterling Patio grill. This is up to a $325 value! FREE shipping offer. Get ready for moist and flavorful grilling like you have never experienced before, with the TEC G-Sport FR infrared grill. Using a unique and efficient all infrared burner system, the TEC G-Sport FR grill cooks with 100 percent infrared energy, eliminating hot air and reducing moisture loss in food by up to 35 percent. Save on fuel with extremely fuel efficient burners, using 50 percent less gas than other infrared burners on the market. The TEC patented flare-proof stainless steel infrared burner system combined with the radiant glass emitter panel results in tender, juicy, charbroil flavored food. The position of the stainless steel cooking grates, radiant glass panels, and infrared burners creates even heat distribution across the cooking surface and virtually eliminates flare-ups. The TEC G-Sport FR natural gas grill eliminates the need of a side burner because you can place your pots or pans on the cooking grids or radiant panels to heat and cook like on an indoor cooktop. The convenient design of this unit makes it easy to transport to sporting events or vacation destinations. 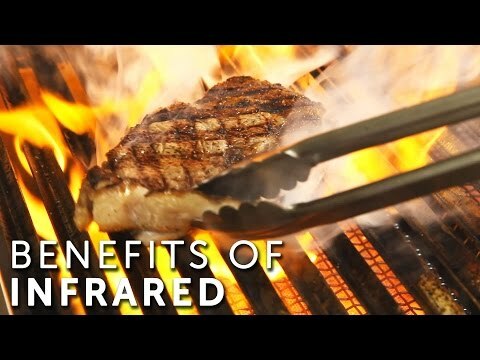 This American-made portable infrared grill is built to last, resisting rust and dents with a thick 304 grade 18-gauge stainless steel body, 309 square inches of cooking area, a stainless steel grid burner rated at 22,000 BTUs, a stainless steel removable drip tray, and is certified to use on any surface, including wood. The grill head measures 30-inch wide, and is 36-inches wide with the handles. The push button battery ignition, self-cleaning glass radiant panels, and removable inner trim panels make it easy to clean and operate. This grill ships as propane and includes a natural gas conversion kit. Cooking Grid Dimensions 22 X 14"
TEC warrants the stainless steel housing to be free of defects for the lifetime of the product. TEC also warrants the burner assembly to be free of defects for a period of ten years from the original date of purchase, and all other components, including the ignitor, for a one year period after the original date of purchase. I am not a review type person, but felt compelled to write about this product. First, I was skeptical that this unit would be able to maintain temps with a lot of meat on it--- like its big brothers. Wrong-- Within 10 minutes it is ready to go at a measured 986 degrees, and it maintains it. It generates so much heat that you can see a tornado of smoke streaming off the meat into the sky, and yet, there is no fire! I don't know if it is because of this high heat that the steaks taste charbroiled, but they definitely taste much better than any gas grill I have ever used. They have the authentic taste of a charcoal grilled steak. If you "sous vide" steaks, you are going to love this unit. It grills the outside so fast that the temp of the steak is not affected. Here, at last, are high end restaurant quality steaks at home. Of course, if you finish a brisket or ribs from the smoker on the TEC you'll be pretty impressed by the results. I have used the TEC for about 6 months and can't conceive of finding anything better than this. I rotisserie chicken so I can't comment on the results of grilling whole chicken, but skinless breasts have the char taste I like and remain quite juicy. Had this for a little over a week now. Have done most meats (chicken, chicken wings, Pork, ans Steak) and a little veggie cooking. Everything has turned out great. My father-in-law said his steak tasted better than the four star restaurant he ate at the previous week. Heats up very fast and gets very hot. Heat is controllable....this was very helpful when doing some of the wings and veggies. Very easy to clean thus far, although it is a little extra step, but no biggie thus far. Would and have recommend to my friends. So far I am singing the praises of TEC!